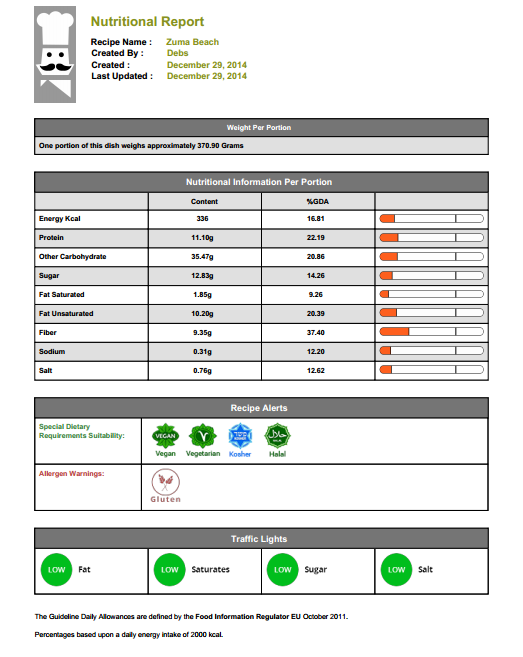 As well as providing full nutritional information based upon the Guideline Daily Allowance (GDA), MenuAnalyser also provides you with the optional facility to include the Food Standard Agency (FSA) Traffic Light System on your menus. The Traffic Light System is a voluntary food labelling standard that has been adopted by many large retailers and manufacturers including Waitrose, the Co-Op, Sainsbury's, Boots and Marks & Spencer. The scheme is also supported by consumer groups such as WHICH, The National Consumers Council, National Heart Forum, Royal College of Physicians, National Heart Forum and Netmums. Research has shown the Traffic Light System works better than %GDA figures across all socioeconomic groups. This means that the Traffic Lights System is less likely to widen dietary inequalities by only being useful to the most numerate or literate customers. For example, the Netmums website surveyed more than 17,000 parents and found that 80% of them preferred the Traffic Light System. Why Put Traffic Lights On Your Menu? Because many of your customers want a quick and easy way of identifying the most suitable dishes on your menu but may not be equipped to understand the %GDA calculations or are simply 'not interested in figures'. As always, the choice about which nutritonal information method to use is yours. It's optional. A list of the ingredients in your recipe together with full costing information.